Can We Bring Sergeant Charles Kelly In From The Cold? As most of you will know, one of the most important jobs that the Commonwealth War Graves Commission does is to maintain the 'Debt of Honour' database. This is the database on their website that records the details of all of the Commonwealth Soldiers, Sailors, Airmen, Nurses etc who died as a result of their service in both World Wars. In order to be included on the database for WW1, the casualty has to have died between 4 August, 1914 and 31 August, 1921, if the death occurred after 31 August, 1921, irrespective of the cause of death, the deceased will not be remembered on the 'Debt of Honour'. Death between those dates for someone still serving was sufficient for them to be included, I know of cases where the cause of death was 'Spotted Fever' or in late 1918, early 1919, the Flu Pandemic, and these men are included because they were still serving at the time of their death. By the end of the war, many men especially, had been invalided out of the services due to wounds, ill health etc due to their service, provided that they died on or before 31 August, 1921, they could be included if the Ministry of Defense (MoD) was satisfied that their death was as a result of the injury or illness that they suffered while serving. Unfortunately, there was a problem that led to many ex servicemen who died as a result of injury or illness attributable to their War Service not being included on the 'Debt of Honour', and that problem was simply that no one told the MoD that the person had died!. Over the last few years there has been a growing awareness, especially in the UK, that there are a large number of men (and probably a few women) who should be remembered on the 'Debt of Honour' but are not, and individuals and groups have set about petitioning the MoD on behalf of these people to try and get them added to the database. The term within the Great War community for this activity is 'bringing them in from the cold'. It seems to me that one such person is Sergeant Charles Kelly. 1133 Royal Dublin Fusiliers & 198119 Royal Engineers, and this is the story of my attempt, on behalf of Kevin Kelly, Charles' nephew, to bring him in from the cold. I first heard of Charles soon after the Dublin Branch was formed when Kevin gave me two sheets of paper on which were the details of the military service of three Kelly brothers, Patrick Joseph (Kevin's Father) who survived the war, John Joseph, who died of wounds on 31 March, 1917, and Charles, who survived the war, but died on 6 March, 1921, according to Kevin, from the effects of being gassed during the war and who is buried in Glasnevin. I kept the sheets of paper on my desk in the 'to be looked at' pile with the intention of coming back to them later to see if I could do anything with the information on them. At the start of November, 2012, I decided to create a memorial page on the website where people with an interest in the branch or the Dublin area, could ask for the names of their ancestors who had fallen in the Great War to be recorded. One of the replies I received was from Kevin who asked that I include both of his Uncles on the memorial. As with all of the other replies I received, I checked the information Kevin gave me given against the details held on the Commonwealth War Graves Commission (CWGC) 'Debt of Honour. However, while the information for John Joseph checked out I could not find any trace of Charles. I contacted Kevin and told him this and that even at this late stage it might be possible to get Charles added to the 'Debt of Honour' and that if there was not a headstone on his grave it might also be possible to get a CWGC headstone erected. As I had had success in the past in getting people added to the 'Debt of Honour' I offered my help in getting Charles added. Kevin replied accepting my offer of help and telling me that he had been in touch with Shane MacThomais, the historian at Glasnevin Cemetery Trust, to see if Charles could be added to the War Memorial there. However, Mr. MacThomais had replied that Charles was not on the list that the Trust and the CWGC had been using in recent years when marking the graves of the Great War Soldiers buried in the cemetery. This came as no surprise to me as the list would have been created from the information held on the 'Debt of Honour'. Kevin also confirmed that Charles was in an unmarked grave. The next step then was to gather whatever information I could and send this off to the CWGC. 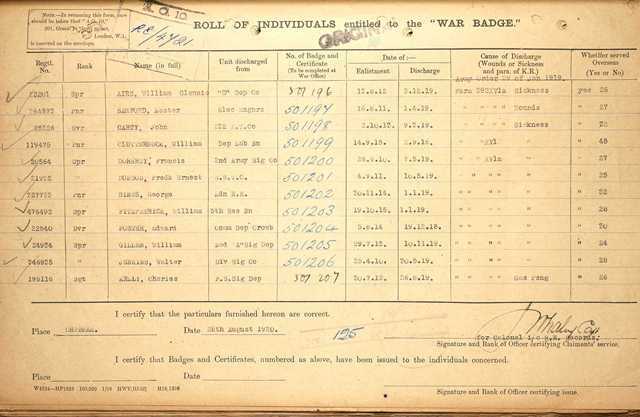 Kevin already had a copy of Charles' Death Certificate, and I was able to get a copy of his Medal Index Card and his entry in the official records showing that he had been awarded the Silver War Badge. The Death Certificate confirmed that Charles had died within the prescribed time frame, that he was an Army Pensioner and that cause of death had been Tuberculosis Pulmonary. 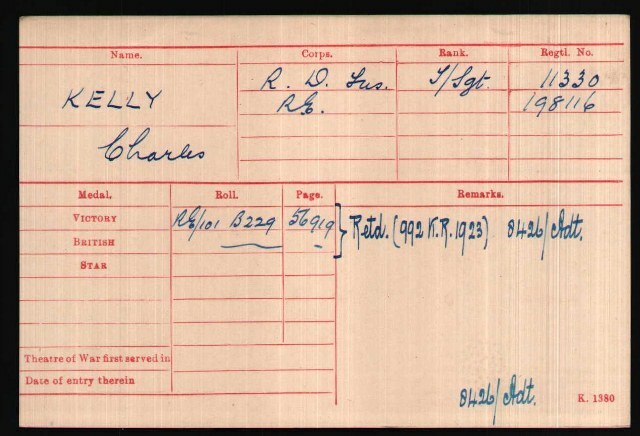 The Medal Index Card confirmed the Regiments he had served in and his Regimental numbers. And his entry showing the award of the Silver War Badge confirmed that he had been discharged due to Gas Poisoning. So, armed with this information, I wrote to the CWGC on 26 November, 2012, enclosing copies of the relevant documents, asking that Sergeant Kelly's case be looked at with a view to including him on the 'Debt of Honour'. Within a few days a card arrived from the CWGC acknowledging receipt of my enquiry and promising a fuller reply in due course. 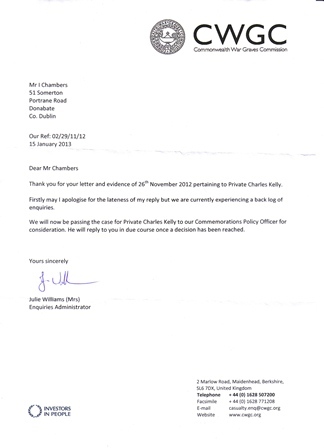 Well, the fuller reply arrived on 18 January, 2013, but as I suspected would be the case when I received the first response, the 'fuller reply' turned out to be 'we are looking into this case and will contact you again when a decision has been made'. Apparently, the case has been passed to the Commemorations Policy Officer, this does not make it clear if this is a position within the CWGC or is with the MoD, my understanding is that the final decision in a case like this rests with the MoD. I have heard through the 'grapevine' that the person within the Mod who's job it was to decide on these cases retired some months ago and has not been replaced and that consequently there is now a considerable backlog of cases waiting to be looked at, it could be a long wait! Well despite having chased this matter up with an M.P. 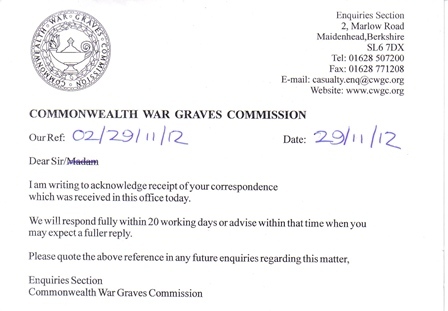 its now almost a year since I first contacted the CWGC and nothing further has been heard, so this morning I got in touch with them again. It seems that there may be light at the end of the tunnel!! The MOD have now delegated the authority to make decisions in case's like Charles' to the National Army Museum, this new system will come into force in January and the CWGC have told me that they will try to get Charles' case dealt with as a priority. Being November, I went down to Glasnevin in the afternoon to lay a wreath at the Memorial. Having failed to locate Charles grave by myself in the summer this time I tracked down one of the workmen who very kindly took me to Charles' grave where I left a small cross in his memory. Well, the decision has finally arrived, and sadly, it is that the request to have Charles added to the 'Debt of Honour' and a CWGC headstone placed on his grave has been refused. 1.There is no contemporary documents to suggest that the Tuberculosis was linked to Charles having been gassed. 2.Because of the 'large' gap between discharge and death it is unlikely the gassing and Tuberculosis were linked. 3.Tuberculosis was a very common disease at the time of the Gt. War and many people suffered from it even though they had not been gassed, therefore it cannot be said that it was the gassing that caused the Tuberculosis. If you would like to read the full decision, go to the photographs section of the website and look in the album entitled: Sgt. Charles Kelly. CWGC Adjudication. March 2015.